Also known as oxygen desaturation, hypoxemia is basically a condition that is classified by an abnormally low partial pressure of oxygen within the arterial blood. The fact of the matter is that oxygen cascade, or the delivery of oxygen from the outer air to body cells is extremely sensitive to a number of abnormalities. All of these can appear anywhere in the air (reduced oxygen content for instance), lungs, airways, or even the cardiovascular system. A few of its causes and examples are mentioned below. Remember, it is rather common for hospitals and critical care professionals to make use of oximeters these days in an effort to define blood oxygen levels and make diagnosis for hypoxemia. If truth be told, the normal oxygen levels in our blood stream are believed to be nearly 85mm Hg. However, people who suffer from hypoxemia typically find these levels to be around 60 mmHg. 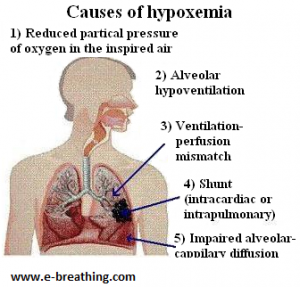 On the whole, when you suffer from hypoxemia, the oxygen saturation in your body becomes less than 90 percent, which also happens to be the formal definition of hypoxemia. 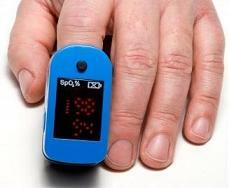 Normal pulse oximeter readings can be anywhere between 95 and 100 percent. If these go below 80 percent, then the condition is considered as being severe hypoxemia. Just so you know, hypoxemia has the potential to impact one’s quality of life rather profusely. Even nocturnal hypoxemia, which is the temporary desaturation of haemoglobin during sleep, can affect life quality rather negatively. If truth be told, in a majority of cases, transition to a horizontal position, overeating, sleep (particularly REM sleep), physical exercise (for example, in cystic fibrosis and COPD), and slouching (poor posture) has the potential to trigger hypoxemia, or even extreme cases of hypoxemia. Nocturnal desaturation is common in a number of conditions, which are inclusive of heart disease, cystic fibrosis, and diabetes. Although hypoxemia has the potential to get triggered all of a sudden, or even because of an unusual situation, a majority of cases of chronic hypoxemia are associated with gradual worsening of blood oxygenation because of chronic lung diseases, including cystic fibrosis, lung cancers, COPD (severe asthma, emphysema, bronchitis etc. ), bronchiectasis and many others. In such cases, gradual reduction of blood oxygenation typically tends to be accompanied by hypercapnia (excessive levels of CO2 in the arterial blood), where the simple single cause is an abnormal breathing pattern which is manifested in factors like thoracic (or chest, or shallow) breathing, hyperventilation, mouth breathing. For references, please visit NormalBreathing.com. 8. Possible appearance of allergies etc. Remember, alveolar hyperventilation can also leads to the onset of two other factors known as mouth breathing and chest breathing. Chest breathing is known to instantly trigger reduced blood oxygenation, considering that the lower parts of the lungs receive nearly 6-7 times more blood because of gravity as compared to the top parts of the lungs. On the other hand, mouth breathing is known to cause a reduction in alveolar CO2 because of reduced-dead volume, possible lessening of the absorption of nasal NO (Nitric Oxide), as in frequent respiratory infections and cystic fibrosis. Bear in mind that alveolar hypocapnia contributes straight to worsened ventilation-perfusion ratio. Note: Severe cases of hypoxemia require instant, emergency medical care. The treatment prescribed in such a case for hypoxemia is inclusive of supplemental oxygen therapy and mechanical ventilation. On the other hand, more than 600 Russian MDs have performed the successful treatment of chronic hypoxemia of patients suffering from cystic fibrosis, COPD, emphysema, severe asthma and a number of lung diseases. The treatment that they provided their patients with was based on breathing retraining using either the famous Buteyko breathing technique or the Frolov breathing device therapy. On the whole, breathing exercises performed using the Amazing DIY Breathing Device have the potential to produce an instant substantial increase in oximeter readings as compared to any other breathing device or technique, in cases where this reading was low at rest. But, it is also extremely important for one to deal with lifestyle related risk factors. These are inclusive of incorrect or inadequate physical exercise, mouth breathing, supine sleep, overeating, nutritional deficiencies and many others. Dealing with these factors can easily help achieve permanent changes in one’s automatic breathing patterns.